Honesty in hard work gives you the spirit that helps you stay put on the right course. It is this force that helped Srijan to clear the most coveted Engineering Services Exam with flying colours. IES Master: It’s a huge success. How was it received in your family? Who was the first person in your family you informed? Srijan: It was really a great information when I got to know that I have secured AIR-3. First of all, I called my father to inform him about my rank, and he was very to hear that I have secured All India Rank 3. My family was confident that I would qualify, but AIR-3 in itself was very great achievement, and my parents and my sister are very happy on my achievement. Persistent hard work has an uncanny tendency… it surfaces, as it has to… there’s no way out for it, otherwise. Chirag Singla is one such story that UPSC scripted in ESE 2018. Take a sneak peek into the making of this ESE 2018 ranker from NIT Jallandhar. IES Master: Chirag why did you choose Engineering Services as your career path? Chirag: Engineering Services is basically a dream job for every engineer as it involves the technical application of knowledge, and I also have good rank in GATE 2018 so I have good technical knowledge so I want to ensure that the field in which I will work I would put in use my good technical knowledge. That’s why I want to join Engineering Services. IES Master: Take us through this inspirational journey, starting from JSS to UPSC? Reema: I started preparing for ESE in 2015 basically at the end of my third year. I joined a coaching, but after joining I was not confident that I would be able to crack it in the first attempt. But I joined it because everyone was going for it. After I gave my first ESE exam i.e. ESE 2016, I was short by 34 marks to qualify for Interview. Then I realised that if I would have been confident, I would have done it. So then I joined IIT Delhi to pursue my Master’s as I got a decent GATE ranking. At IIT Delhi, the environment was very good. After coming to IIT Delhi, I analysed very properly that what I have to do. How can I score very good marks in my second attempt. So what I did was that I prepared for 6 months. Basically during these 6 months, I did not solve a single question, I read only IES Master study material. So this plays a very important role in achieving good ranks in GATE as well as ESE. After that I followed test series very religiously, be it for Mains or Prelims. Then for Interview Guidance, I joined IES Master Mock Interview program. In this truly enthralling one-to-one with IES Master, Vinay Prakash Sharma, AIR 1 (CE), ESE-2018, reveals the real side of his success story and gives an insight into the major ingredients that go into the making of an ESE topper. IES Master: Vinay it’s a huge success, how was it received in your family? Who was the first person you informed in your family? Vinay: Thank you so much. I informed my father first, and he was very happy. He couldn’t believe it. He was quite for a minute or so, and then I informed my mom, and she was also very happy. Afterwards, when my sisters came to know about this, they too were very happy. All India Council for Technical Education (AICTE) has put to rest all the speculations that were making rounds on social media as well as on print media regarding the Graduate Aptitude Test in Engineering (GATE). 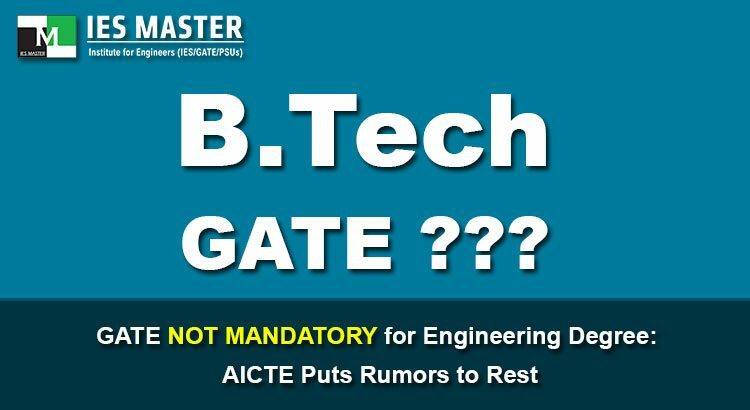 Due to the fake news making rounds on the Internet, engineering students started believing that GATE will soon be made mandatory for engineering students as an exit exam for the academic year 2019-20, to get their B.Tech degrees. 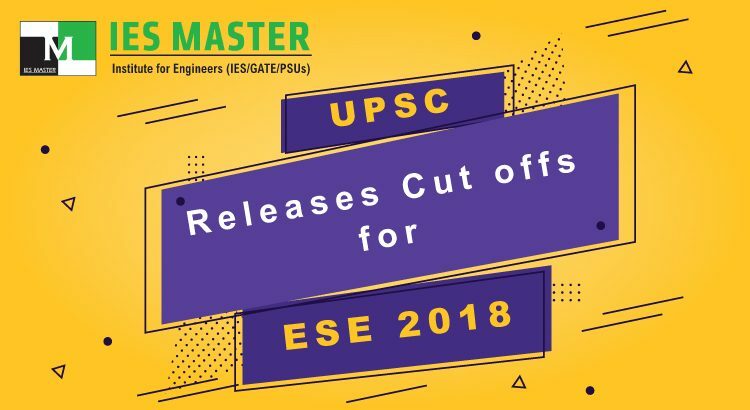 The Union Public Service Commission (UPSC) has released the cut off marks for Engineering Services Examination 2018 (ESE 2018). The cut offs have been released for all the three stages – Prelims, Mains, and Final of ESE 2018. The above cutoff marks are minimum qualifying marks for the Mains stage out of 500. 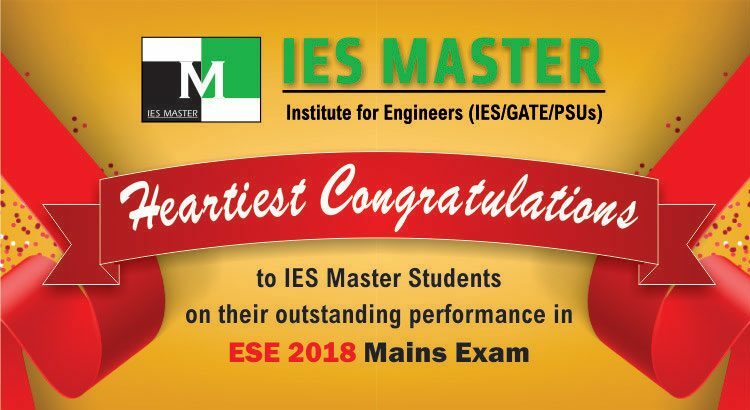 Heartiest congratulations to IES Master Students on their outstanding performance in ESE 2018. 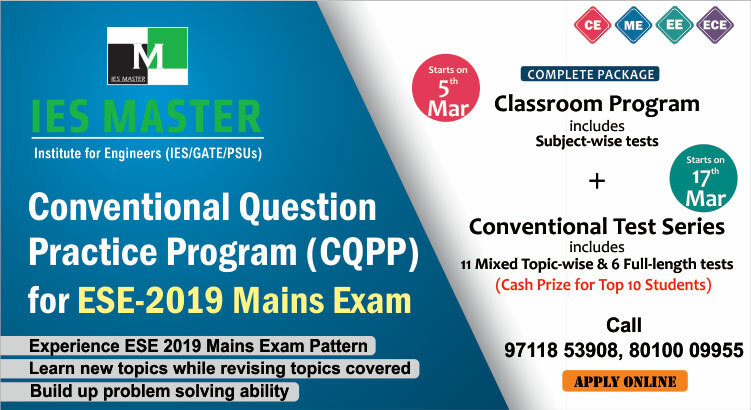 Going by the number of selections in ESE 2018, the concept behind meticulously designed study programs of IES Master, which include its classroom programs, test series, conventional question practice program, interview guidance program, postal study material, etc. have been huge hits. 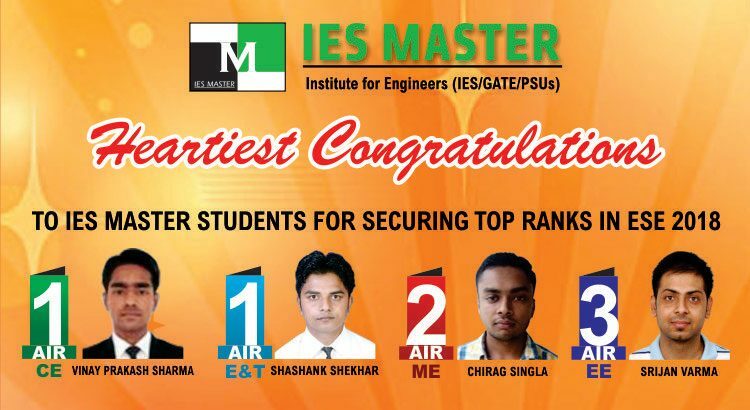 This proves why IES Master is the number one choice of ESE aspiring engineering graduates from all streams, no matter if it is Civil Engineering, Mechanical Engineering, Electrical Engineering, or Electronics and Communication Engineering branches. UPSC (Union Public Service Commission) has declared the final result of ESE 2018. Students can check their ESE 2018 result by downloading the PDF file from the link given in the steps below or from the official website of UPSC. UPSC organised ESE 2018 Main on 01 July 2018, and the personality tests for the qualified candidates were held in between 10 September, 2018 and 26 October, 2018. On the basis of the performance of candidates in the ESE 2018 Main exam and interview, UPSC has released the final list of candidates who are recommended for appointment to various Services/Posts in the Ministries/Departments concerned.